"two weeks DPD3: movement of air"
In brief: For reasons explained below, I am going to have to put Megatokyo on hold for two weeks on account of an unexpected situation which has resulted in me having to do all of the processing of the files for Megatokyo volume 4 myself (about 4 days of work). In the next two weeks I will post four DPD drawings (random, complex and curious ones like the one i posted today) and Dom will grace us with 2 IED (Improvised Explosive Doms). The story will return on April 3rd. Please read on for more information. As i believe i've explained in the past, the process of taking the Illustrator files for Megatokyo and converting them to print format is no small amount of work. 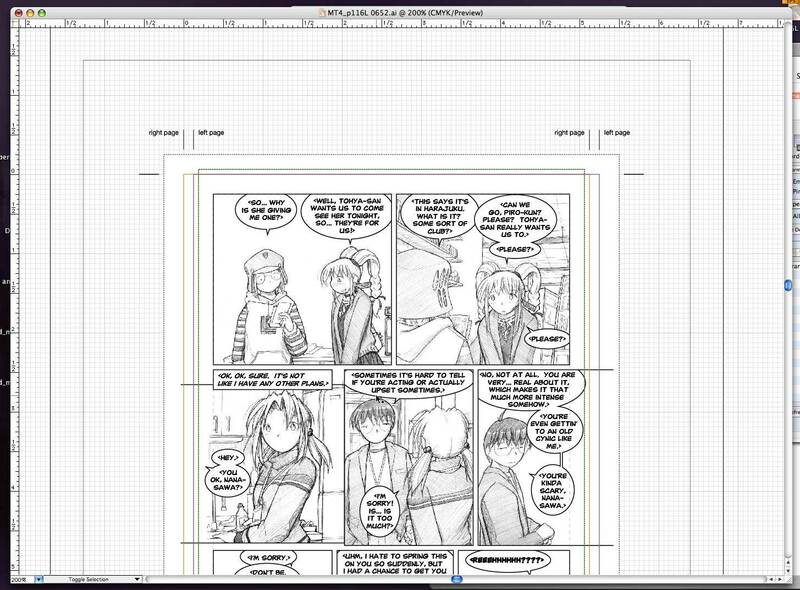 For starters, the aspect ratio of the web version of the comic is different than the trim size for the print versions (the web versions are narrower) and there are a number of steps that are required to get things to that final, 1200 DPI TIFF file. Complicating things further is that starting with Chapter 6 i moved to a new format that makes it easier to convert to print format. While this does reduce the work for Volume 4 somewhat, each file does still need to be processed. All told, this is quite literally 4 days worth of work (i've determined this is based on experience, an average of the actual time it takes to process each file, the number of files to process (179 story comics plus 12 or so OSE and SGD, 13 DPDs and none of this includes any of of the Circuity material). Anyways, in an effort to try to keep the comic going more or less normally and to make sure i hit my print deadlines, i usually try to get some help for this part of the process. It's a lot of repetitive work, with a lot of spot decisions that need to be made about adjusting clipping areas, moving word bubbles around, editing and checking dialogue, and the worst - extending artwork into the bleed area (unfortunately this is something i often do not allow enough of, and have to extend it as part of the process). A good friend of mine was going to help me do this, someone who's artistic judgement i trusted and knew would do a good job taking the majority of these files and providing me with PSD files that i would need to hit only once and check and tweak before i sent them onto DC/CMX. Due to situations beyond his control, my friend suddenly is not able to help me with the processing. This left me with a little bit of a "uh oh, what do i do now?" feeling thing on saturday. My deadline for the book content is April 11. My schedule was already dicy - doing 3 MT comics per week, the extra pages and rehash of Circuity (i have 7 pages to draw yet, and these damn things take longer than MT pages), initial prep of all the files and indexing of the book, etc (nevermind the MegaGear store stuff :P) so the reality of having to suddenly squeeze in 5 days worth of work into this already iffy schedule forced me to face the reality that something would have to give. Since i was already looking at missing 2 comics for Sakuracon, i decided to simply balance things out and take both this week and next to devote my time to getting through this pile of work. If i don't, i fear that it will adversely effect the comic (at a time when i don't want it to - the end of the chapter is fun:) or worse yet - have to break later when we are in the middle of things, miss by deadline (which would delay the book's release) and... you get the idea. It's not all bad (well, except for the SGD stuff). The one positive thing about me doing the processing myself is that i'm the one making all those tiny little decisions that add up to having an overall effect on the look and the feel of the book. It *is* more satisfying to do it myself, I just wish it didn't take so long. I usually miss a comic or two for conventions, and a comic or two when i'm processing files for a book - and so maybe this double whammy shouldn't suprise me. ^^;; the good news is that it's only two weeks, and hopefully by the end of it i'll be in good shape so that the book wont effect the MT schedule any further. Thank you for your patience and support, and i hope you enjoy the DPDs - i'm going to try to do the nicest ones i can. In fact, i might be auctioning off one or two of them after i get back. :) More on that idea later. In regards to the MegaGear store ... please note that Orders placed Wednesday the 22nd through Monday the 27th will not start shipping until Tuesday the 28th. We won't BE here to ship anything ^^;; We're happy to take your orders, and Sarah will dive into shipping things out as soon as we get back from Seattle. Okay, so this one doesn't have the same cute factor as the last one. I find it (and the series it comes from) hilarious, and they're at least joking about being cute. So I'm grandfathering it in. Besides, with what I'll be talking about, I need a dose of funny. You see, I've been watching Kage Kara Mamoru, and I don't know why. Under normal circumstances, I'd call it a guilty pleasure and be done with it. But "guilty pleasure" covers things like ice cream, bacon cheeseburgers and trashy TV talk shows. You know, things you know are bad for you, but you do them anyway in a moment of weakness because you just can't help yourself. KageMamo? It's like stealing a rib separator from the hospital, using it on yourself and filling your chest cavity with a spicy little homebrew concoction of lye, gasoline and your own urine. It takes a special kind of premeditated masochism to watch this show, and I'll tell you why. KageMamo is, above all things, STUPID. And it's not just the main characters. The female lead is an idiot, sure. She needs to borrow other people's hands to count past 10, and she'll buy just about any explanation you feed her. Sure. Mamoru, the main character, is secretly a ninja dedicated to protecting her family? Sure. I can accept that, too. Heck, the word "ninja" is what first made me watch the series anyway. And, since the main girl is so dumb, I guess I can buy the fact that she hasn't noticed the ninja living next door for her entire life. But then the stupidity just keeps piling on, adding cliche after cliche after mind-numbingly stupid development. There's the samurai girl whose sword can cut anything but Nata de Coco. There's the Iga/Koga ninja clan... sports festival. There's the song that is just the word "banana" over and over again. Compared to the vast stupidities the show offers, the usual "All the girls like the guy, guy is too thickheaded to notice" cliche--which, I feel obligated to mention, is well-represented in the show in all the classic ways--is a mere drop in the bucket of moronitude (is moronitude even a word? Has this show sucked out my language centers and caused me to create new words to describe its stupidacity?) that is the KageMamo package. I mean, I have lost brain cells to this show and not just to brain death. I think that as I was watching the talent show episode, I heard my brain cells calling their agents and jumping ship to Hollywood, so at least they'd have some cocaine before their inevitably horrible death. Were this a Newtype review or an old GamePro preview, I'd laugh off the flaws and look for something good to say, like "hey, it has ninjas!" or... uh... "hey, it has ninjas!" Alternately, I'd make some sort of pithy, punny comment that was something like "If you're absolutely shuriken that you want some ninja action in your life" or... "hey, it has ninjas!" But, no, the closest thing I can come to that for this show is "If you enjoy driving nails into wood with your forehead, you'll LOVE KageMamo". And that's the kind version. Now, if you'll excuse me, I have episode 11 to watch. I think they go into an underground maze searching for an ancient treasure in this one. A treasure guarded by ninja mole men. I must really hate myself.